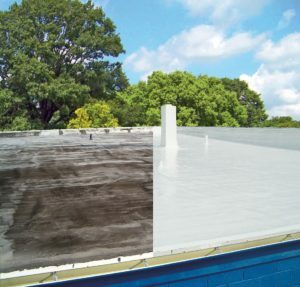 If you are considering cool roof coatings for your office or retail space in the Clearwater, Florida, area, let the experienced professionals at Elite Roofing Services help you understand your different options. We’ve provided comprehensive roofing services in the area for more than two decades, offering the most reliable products on the market during that time. The potential benefits that cool roofing systems provide are numerous. Not only do they help to weatherproof your roof, but they can significantly reduce heat transfer. This can lighten the strain on your building’s HVAC system and potentially reduce energy costs, while also extending the life of your roof. In addition to roofing installation and repairs, we also offer maintenance programs that can help you identify a potential roofing issue before it becomes a costly repair project. Our technicians will inspect your roof on a quarterly, bi-annual, or annual basis to look for potential problems, and provide recommendations about how to keep your roof in optimal condition. Contact Elite Roofing Services today to learn more about cool roof coatings and the potential benefits they provide businesses in the Clearwater, FL, area. Be sure to ask about our free inspections and estimates.